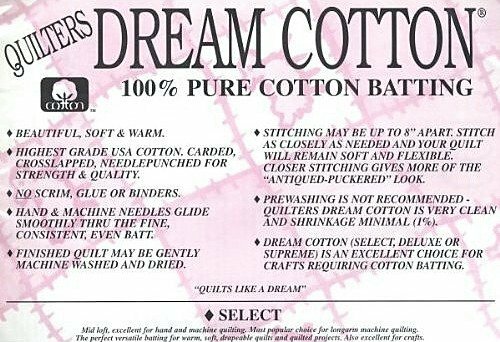 Quilters Dream Cotton Batting starts with the finest 100% pure USA natural high grade cotton and is carded, crosslapped and specially needlepunched for strength. The special process prevents shifting and lumping. It has a very high thermal value (R=3.8) warm, yet light. Environmentally friendly, no chemical resins or binders. 100% natural, this batting proudly bears the Cotton Incorporated’s seal. 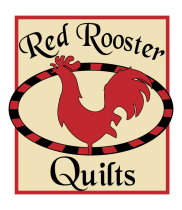 Stitching up to 8" apart allows quilters wonderful freedom of design. Needles (by machine and hand) glide smoothly through the fine, consistent, even webbing. No scrim to resist your needle. No prewashing necessary. Only 1% shrinkage in a cold wash, air dried. 3% shrinkage in a warm wash, warm dried. Remember, your prewashing and selection of fabrics and thread will also effect shrinkage. Select Loft is a mid-loft for hand and machine quilting. 4 oz. per square yard. Excellent for crafts. Extremely soft. Drapes beautifully. Twin Size: 93" x 72"